The Rawlins County Courthouse is still there. And so is the Atwood Buffalo. 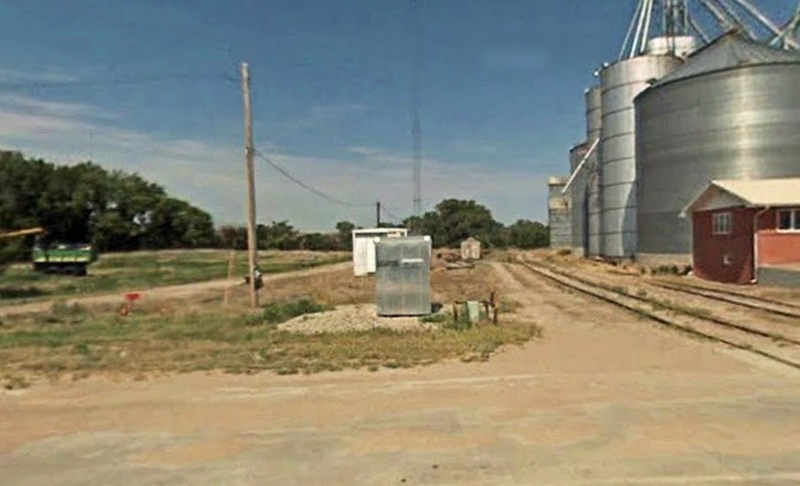 Like most counties on the Great Plains, Rawlins County grew rapidly for a few years after it was settled by folks of European descent, but people have been gradually slipping away ever since. Today, the population is about a third of what it was in 1930. Yet if you're going to have a county, you're still going to need a county court, county appraiser, county clerk, county treasurer, yadda yadda yadda, and why not conduct such business from a fine old building in the middle of town? Here's a picture from only a few years back. 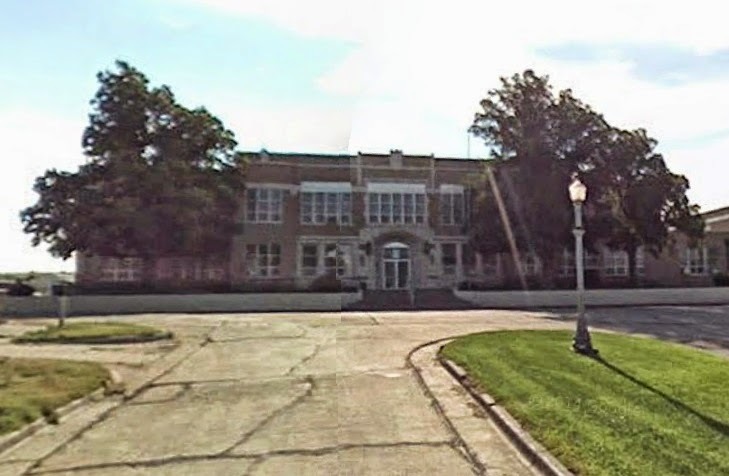 The building is still there, and it's still the community's high school. Its name is Rawlins County High School now, and it absorbed its last remaining in-county rival, Hearndon High, after the 2003-2004 school year. This, too, is often the way of things on the Plains. 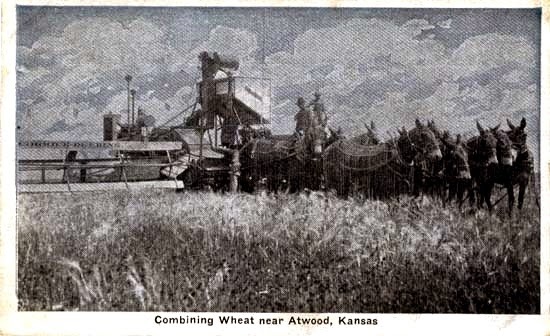 At the peak of the Great Plains boom, there were at least ten viable towns and villages in Rawlins County; now there are but three, and only Atwood has schools. That's lucky for Atwood. Without a school, you'll have noticed, a town has a doomed, empty feel to it. There are some serious new trees at Rawlins County High. The lamp-post is new, too, but it's much the same idea as the old one. I like that. The Burlington and Missouri River Railroad, it says here, was an Omaha-based company founded in 1856. Aquired by the Chicago, Burlington, and Quincy in 1872, it connected Chicago, St. Louis, Omaha, and Denver by crossing sparsely settled terrain in gaps between the routes of earlier railroads. On this 1882 map, its main line can be seen passing one county north of Atwood, in Nebraska. Except, Atwood's not on the map. The three towns shown in Rawlins County -- Kelso, Jerome, and McCloud -- have long since disappeared. I mean, literally. It's not like they're ghost towns. They are just gone. There's nothing. They have left no visible traces outside of a few sentences in the historical record. This, too, is typical of the region. 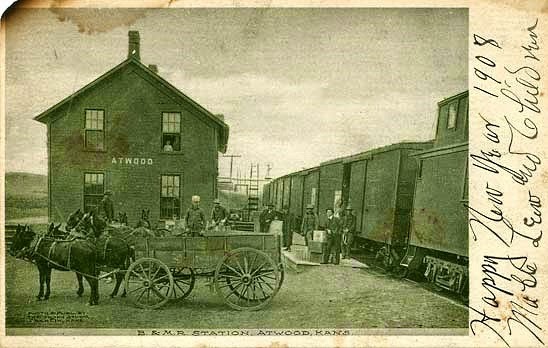 In an April 1901 article in the Kansas Semi-Weekly Capital, we read about a late and crippling snowstorm that has shut down the "Orleans & St. Francis branch" of the B & M R, a line that is described as passing through Atwood on an east-west route. 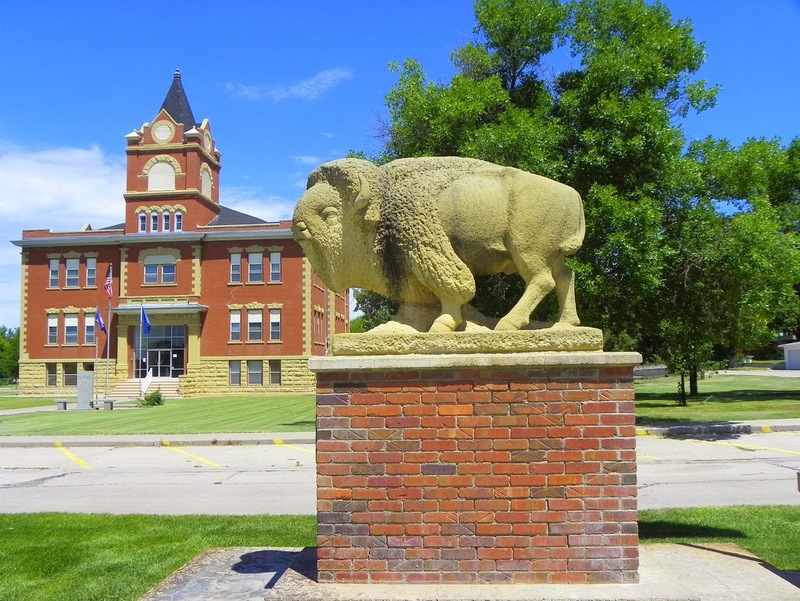 (And incidentally, if the Monday Quiz left you longing for the happier, simpler days of a century ago, the website where I found this story offers a truly heartwarming collection of newspaper stories about small-town life in the heartland at the turn of the twentieth century. Wait, did I say "heartwarming"? I meant "blood-curdling." But I digress.) From there, if you have aerial photos and a little expertise on deducing the impact of railroad lines on a town's morphological development -- and by gum, I happen to have written a thesis on this very topic -- you can make a very reasonable guess about where the postcard photograph was taken. Here's what that site looks like today. Which is to say, the B & M R Station no longer exists. Beautiful LAKE ATWOOD where fishing, picnicking, and boating are enjoyed, Atwood, Kansas. Beautiful Lake Atwood is still there. 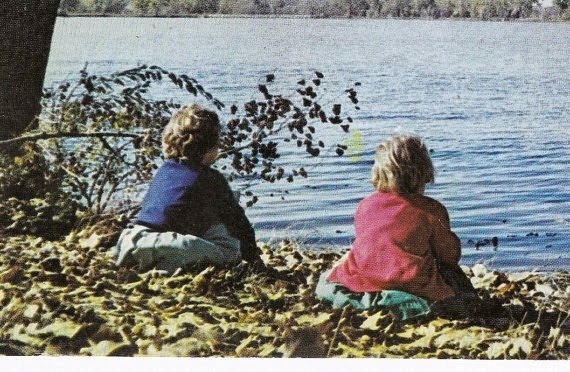 Fishing, picnicking, and boating are still enjoyed. So, since 2011, is frisbee golf. Lake Atwood is not, of course, an actual lake, but a shallow little reservoir at the northern edge of town. This is persnickety of me, but I always think it's strange to call a reservoir a "lake," especially on the pancake-flat Great Plains, where their artificiality, and more to the point their berms, are so obvious. On its website, the Kansas State Department of Wildlife, Parks, and Tourism indicates that This lake is currently dry, and undergoing a basin sealing project. Plans are for the job to be completed by the Fall of 2008. Well, the KSDWP&T must be between webmasters or something. The current Google Maps image shows the eastern half of the "lake" full, and the western half plowed, or scraped, or something. Perhaps it is undergoing a basin sealing project. The little girls in the photograph grew up, had very fulfilling lives, and are now enjoying the golden years of their retirement. They still combine wheat near Atwood, Kansas. As you probably know, that doesn't mean they are combining it with anything. Rather, they are using a "combine," an extremely clever machine that combines the three main activities of harvest: reaping, threshing, and winnowing. Reaping -- cutting the grain down -- seems like the hard part, but no. The hard part is threshing, which means beating the hell out of the sheaf to loosen the kernels of grain. You could do this by literally whipping the grain with flails, or beating the sheafs against something hard, or having your cattle walk on it, but there's no easy way to do it without a motor. Once the grain is loose, you winnow it to separate it from the chaff, which is to say the inedible non-grain bits. The easiest way to do this is to toss it into the air and let the wind carry away the lighter stuff. It's easier then reaping and threshing, but it takes forever. The creation of ever more powerful combines that reap, thresh, and winnow simultaneously and for all practical purposes instantaneously has meant that instead of needing the sustained cooperative labor of an entire village to bring in a grain harvest, you can have a reasonably bright teenager do it by himself while he listens to old Metallica on the cab stereo. And this, of course, is why the population of the Great Plains is so much smaller now than it was one hundred years ago. Here's what it looks like, more or less, to combine wheat near Atwood, Kansas, these days. This may be the best set of boring postcard updates yet! Well done!